The Free-Standing Mobile Access Stair System (FSMASS) provides safe access for working surfaces up to a maximum 5.5m height. 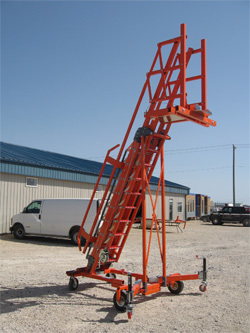 The stair-step design provides safe access to and from work areas while carrying tools and each unit is equipped with two davit anchor points providing fall protection for up to two users. Adjustable outriggers enlarge the base footprint to stabilise and level the system when in use and collapse into the base to create a small and mobile package for transportation.